There is an old saying that “elections have consequences” and in Harris County, Texas, that saying has new meaning. This past November, Democrats swept every single race in Harris County during the midterm elections, turning the county completely blue. Prior to the midterm elections, one of the most controversial and highly charged issues at the county level involved bail reform. There was heavy pushback against bail reform in Harris County, mostly from the Republican judges who had served on the bench for years, which caused backlash amongst many activists and community leaders. That backlash resulted in Harris County voters showing up to the polls and sending those judges packing, allowing a new crop of Democratic judges to take up the issue of bail reform in a swift and more progressive manner after being sworn in on January 1. 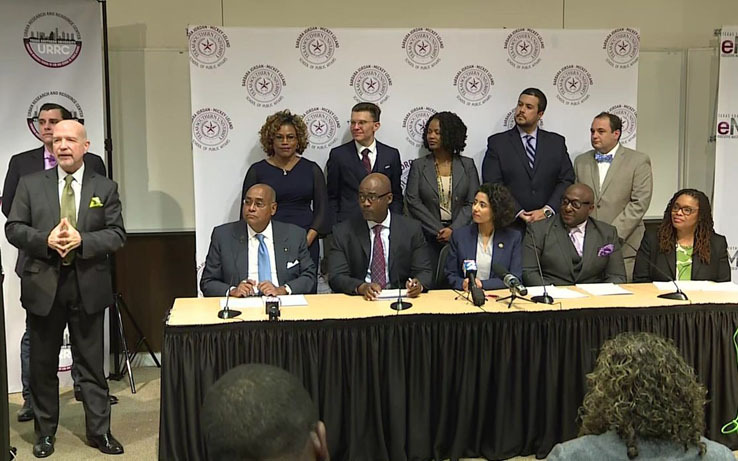 This new slate of 15 Democratic county judges recently held a major press conference at the Barbara Jordan-Mickey Leland School of Public Affairs building located at Texas Southern University, along with Harris County Criminal Court at Law Judge Darrell Jordan, who has been on the bench since 2017 and who was the first judge to implement bail reform locally, along with many other key county elected officials such as new County Judge Lina Hidalgo, and other activists and community leaders, to unveil significant revisions to Harris County’s current bail system. Jordan announced the passage of Local Rule 9.1, which is a new bail rule that was drafted by the judges, with significant input from Harris County Sheriff Ed Gonzalez, Harris County District Attorney Kim Ogg, as well as from the lawyers who represent the indigent defendants that have been impacted by Harris County’s unconstitutional bail system. The county contingent believes this change will finally bring effective bail reform to Harris County, and they plan to present this adopted new bail reform change to a federal judge to request it be implemented immediately in order to settle the civil rights lawsuit that has been filed against Harris County. According to county officials, Harris County has spent roughly $9 million in public funds on three outside private law firms to defend itself against the 2016 lawsuit brought by two civil rights groups and a local law firm on behalf of indigent defendants who could not pay the necessary money to be released from jail. Under the new bail reform changes, 85 percent of individuals who are arrested on misdemeanor offenses will automatically qualify for release on no-cash bonds, according to county officials. There are some offenses for which there are absolutely no exceptions. Those who are not eligible to benefit from the new bail reform rules change include individuals who have violated bond conditions in an open case, have been charged with domestic violence, have violated a protective order and are facing repeated drunk driving offenses. Under the proposed new changes, defendants will appear before a magistrate or judge within 48 hours, at which time they may also qualify for a personal recognizance bond. Back in 2017, Chief U.S. District Judge Lee H. Rosenthal of the U.S. District Court for the Southern District of Texas handed down a historic 193-page decision, finding that the Harris County money bail system was unconstitutional and ordered Harris County to stop keeping people who had been arrested on misdemeanor charges in jail because they could not pay bail. This is huge news for many Black, Latino, poor and disadvantaged Harris County residents, who have fallen victim to this law. Commissioner Ellis believes the new rule changes enacted by the newly elected Harris County Criminal Court judges, who have only been in office for less than a month, demonstrates a clear commitment to upholding the Constitution and finally settling the bail lawsuit in Harris County. Judge Rosenthal’s ruling served as a severe blow to Harris County, and the results of the midterm elections seemingly delivered the knockout punch needed to reform the bail system, which is a major part of the overall criminal justice system in Harris County. As a result of these new proposed bail reform changes, it appears that other Texas counties that have bail systems that mirror that of Harris County’s unconstitutional bail system could finally see changes coming their way real soon as well. Time will tell. In the meantime, the Forward Times will continue to monitor this issue as it unfolds, particularly during the current Texas Legislative Session, where legislators could effectively pass comprehensive bail reform legislation that would legally force the rest of the state of Texas to transform their current bail systems to do what is right and fair for all Texas residents. Again…voting matters and elections have consequences.